Cameras have always dominated the electronics industry as it has lots of applications such as visitor monitoring system, surveillance system, attendance system etc. Cameras that we use today are smart and have a lot of features that were not present in earlier cameras. While todays digital cameras not only capture images but also captures high-level descriptions of the scene and analyse what they see. It is used extensively in Robotics, Artificial Intelligence, Machine Learning etc. The Captured frames are processed using Artificial Intelligence and Machine Learning, and then used in many applications like Number plate detection, object detection, motion detection, facial recognition etc. 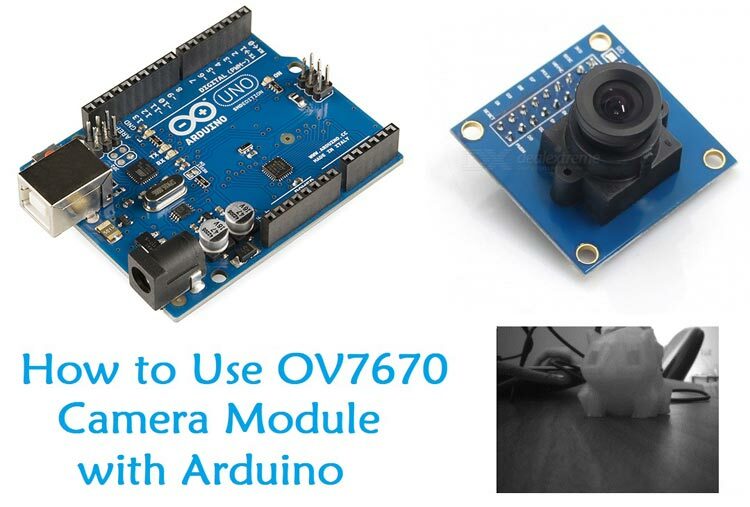 In this tutorial we will interface most widely used camera module OV7670 with Arduino UNO. The camera module OV7670 can be interfaced with Arduino Mega with same pin configuration, code and steps. The camera module is hard to interface because it has large number of pins and jumbled wiring to carry out. Also the wire becomes very important when using camera modules as the choice of the wire and length of the wire can significantly affect the picture quality and can bring noise. The Camera OV7670 works on 3.3V, so it becomes very important to avoid Arduino which gives 5V output at their Output GPIO pins. The OV7670 is a FIFO camera. But in this tutorial, the picture or frames will be grabbed without FIFO. This tutorial will have simple steps and simplified programming to interface OV7670 with Arduino UNO. The OV7670 image sensor is controlled using Serial Camera Control Bus (SCCB) which is an I2C interface (SIOC, SIOD) with a maximum clock frequency of 400KHz. The OV7670 is clocked from a 24MHz oscillator. This gives a Pixel Clock(PCLK) output of 24MHz. The FIFO provides 3Mbps of video frame buffer memory. The test pattern generator features 8-bar color bar pattern, fade-to-gray color bar patter. Now let’s start programming the Arduino UNO for testing Camera OV7670 and grabbing frames using serial port reader. The programming starts with including required library necessary for OV7670. Since OV7670 runs on I2C interface, it includes <util/twi.h> library. The libraries used in this project are built-in libraries of ArduinoIDE. We just have to include the libraries to get the job done. After this, the registers need to be modified for OV7670. The program is divided into small functions for better understanding. The Setup() comprises all the initial setups required for only image capturing. The first function is arduinoUnoInut() which is used to initialise the arduino uno. Initially it disables all the global interrupts and sets the communication interface configurations such as the PWM clock, selection of interrupt pins, presclaer selection, adding parity and stop bits. After configuring the Arduino, the camera has to be configured. To initialise the camera, we only have the options to change the register values. The register values need to be changed from the default to the custom. Also add required delay depending upon the microcontroller frequency we are using. As, slow microcontrollers have less processing time adding more delay between capturing frames. writeReg(REG_COM10, 32);//PCLK does not toggle on HBLANK. The camera is set to take a QVGA image so the resolution need to be selected. The function configures the register to take a QVGA image. In this tutorial, the images are taken in monochrome, so the register value is set to output a monochrome image. The function sets the register values from register list which is predefined in the program. The below function is write to register function which writes the hex value to register. If you get the scrambled images then try to change the second term i.e. 10 to 9/11/12. But most of the time this value works fine so no need to change it. This function is used to get the image resolution size. In this project we are taking pictures in the size of 320 x 240 pixels. Other than this, the code also has the I2C configurations divided in to several parts. Just to get the data from camera, the I2C configurations has Start, Read, Write, Set Address function which are important when using I2C protocol. You can find the complete code with a demonstration video at the end of this tutorial. Just Upload the code and open the Serial Port Reader and grab the frames. Step 3: Finally click on “Start” button to start reading serially. Step 4: One can also save this pictures by just clicking on “Save Picture”. If the UNO gives 5V output to GPIO then use Level Shifter. Use 3.3V Input for OV7670 as exceeding voltage than this can damage the OV7670 module. This project is created to give overview of using a camera module with Arduino. Since Arduino has less memory, so the processing may not be as expected. You can use different controllers which has more memory for processing. #define REG_COM7 0x12 /* Control 7 */ //REG mean address. * tweaked to adjust hue and saturation. writeReg(0x11, 10); //Earlier it had the value:writeReg(0x11, 12); New version works better for me :) !!! !